Info "Use the foam hammer to bonk your enemies." Hit Parade is one of Penny's Microgames in WarioWare: Smooth Moves. 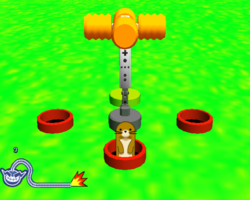 The player must whack the moles with the hammer by tilting the Wii Remote accordingly. This page was last edited on February 20, 2018, at 16:31.